This DVD features one of the most entertaining moments of Australian comedy history and as the crew of the Late Show would say "Champaign comedy". 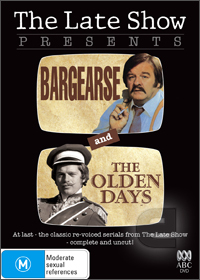 This DVD compilation features the re-voicing of the classic 1976 Crawford's police drama "Bluey" and the B&W ABC's series called Rush that have been humorously and sometimes poorly redubbed by the cast of the Late Show. The one time TV series called "Bluey" has been relabelled as Bargearse and features a healthy dose of gutter humour from fart noises to poorly yet highly amusing dubbed characters. My personal favourite is the Olden Days (Rush) which has some great overacting from the entire Last Show team and features my favourite episode where the main character leaves the gold fields... err... mud-fields according to the remake with the music of "Spanish fly" playing in the background. Brilliantly funny! * Pete Smith sings Aerosmith!